As a team of international astronauts splashes down for a 14-day training mission in FIU’s Aquarius Reef Base, they will be advancing coral reef research at the same time. 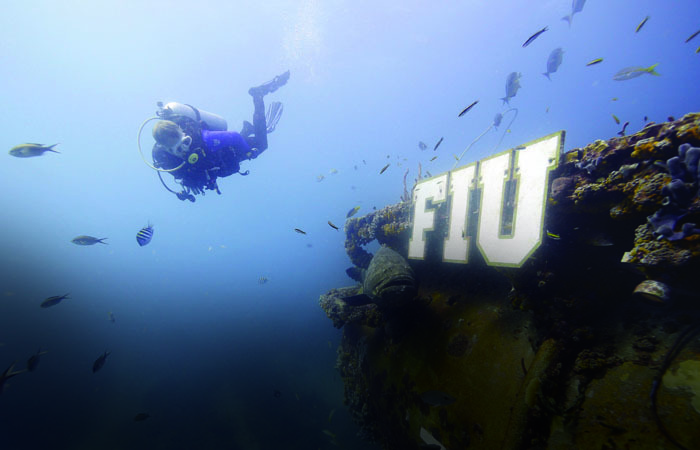 NASA has partnered with FIU researchers to create a real-life scenario for the astronauts as they test communications between land and reef to simulate communications between Earth and space. In addition to data, the astronauts will collect samples for marine scientist Mauricio Rodriguez-Lanetty and his graduate students Daniel Merselis, Katherine Dougan and Guido Bonthond. FIU researchers train astronauts on equipment they will use to further coral reef research as part of a NASA training mission in Aquarius. NASA’s primary mission is to train the astronauts in communicating from distant locations, a challenge that often comes with time delays. The team, which includes a European, one Japanese and two Americans, will also be testing new communications hardware developed by the European Space Agency (ESA). Living and working in the isolated and extreme environment of underwater is the closest thing to actual spaceflight, according to Bill Todd, project lead for NASA’s Extreme Environment Mission Operations (NEEMO). This is the 20th mission in the NEEMO program at Aquarius. The reef project will explore deep water corals, which largely appear to be healthy while their shallow counterparts are suffering. 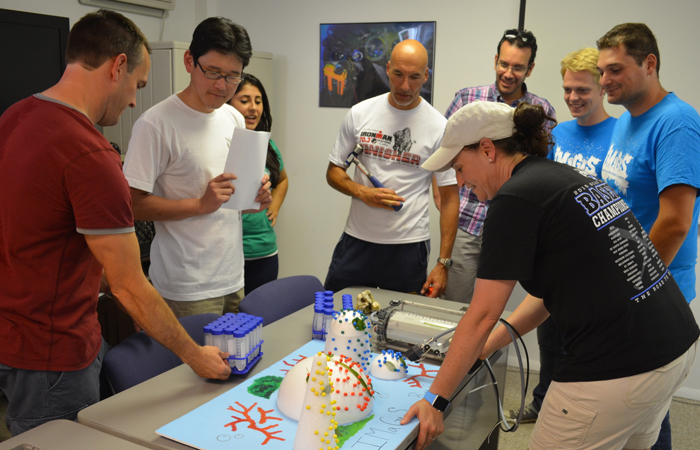 With the help of the astronauts, the FIU students will explore whether the deep water corals could help repopulate the shallow reefs. Their efforts will require both genetic and physiological testing. Little is known about deep water corals, largely because decompression limits the amount of time divers can spend under water. But with the astronauts living and working from Aquarius, they are able to spend much more time in the water than traditional scuba diving allows. The astronauts will collect samples of deep water corals for the students to conduct genetic testing and compare to data on shallow corals. The hope is that the coral species found at the two depths are closely related. The second part of the study will have the astronauts conducting photosynthesis studies on the deep water corals to determine their efficiency in utilizing light, a critical piece of information to determine whether these corals can help seed back depleted shallow areas. NEEMO 20 is scheduled to splash down July 20. Live streaming of Aquarius is available online. Mike Heithaus takes a swim with a grouper outside of FIU Aquarius Reef Base, the world’s only undersea research lab.